Leifheit jars are very sturdy preserving jars from Germany. In the preserving world, Leifheit is not as famous as Weck is. Many people in Germany know Leifheit only for their “cleaning supplies”: small appliances and tools for laundry, kitchen organization, etc. 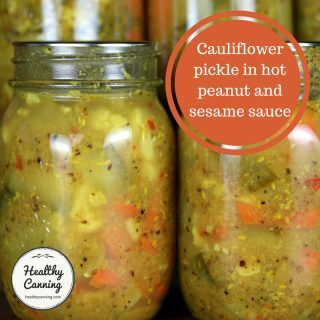 How many Leifheit jars in canners? Are Leifheit lids BPA free? 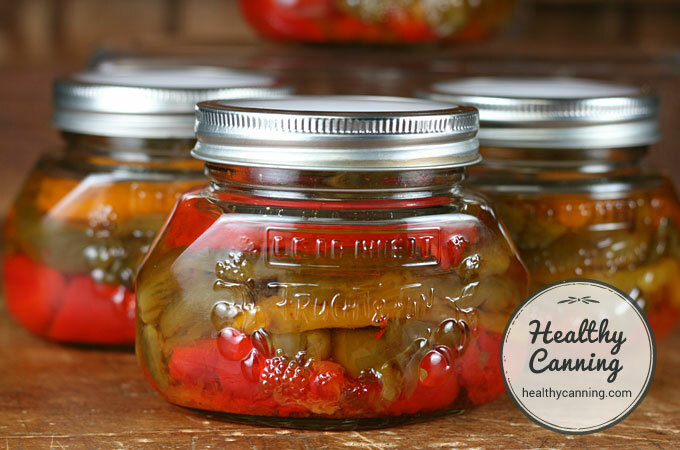 While Leifheit makes many different kinds of preserving jars, it is the Mason-jar style with the 2-piece lid system that would be suited for safe home canning and preserving. 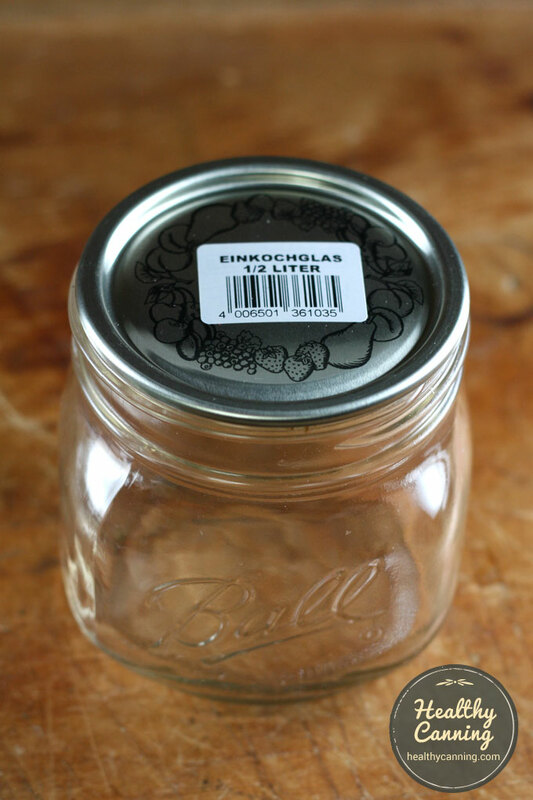 These are wide-mouth jars, that take standard 86 mm wide mouth Mason-jar lids with a plastic gasket on the underside. 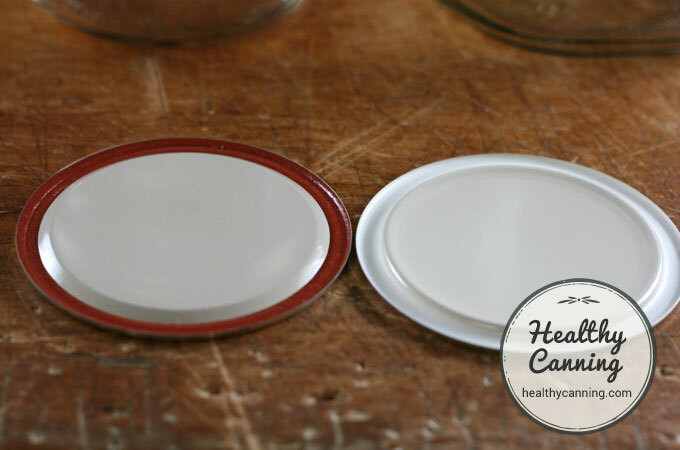 North American wide-mouth mason jar lids and rings fit them. 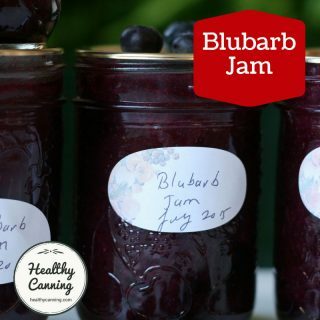 On the front, the jars have embossed lettering that says, “Frucht & Fun.” That means, “fruit and fun.” The jars are completely plain on the sides and back, so you have lots of other places to label the jars. 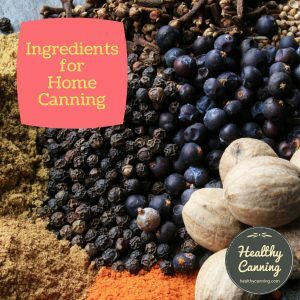 To be clear: this page does not constitute a recommendation for or against the jars for home canning. 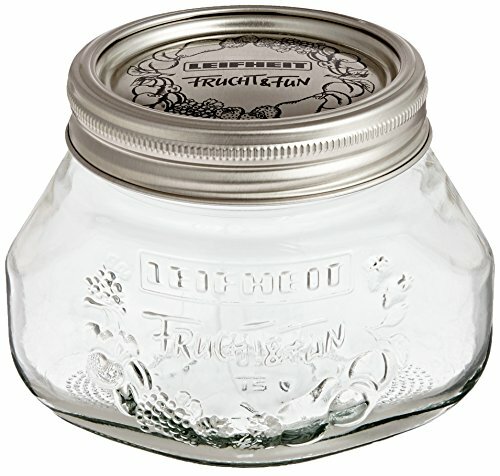 It is for informational purposes only, particularly for people in countries where traditional North American brands of Mason jars are not available. The jars come in 1/2 litre (1 US pint), 3/4 litre ( 1 1/2 US pints), and 1 litre (US quart) sizes. 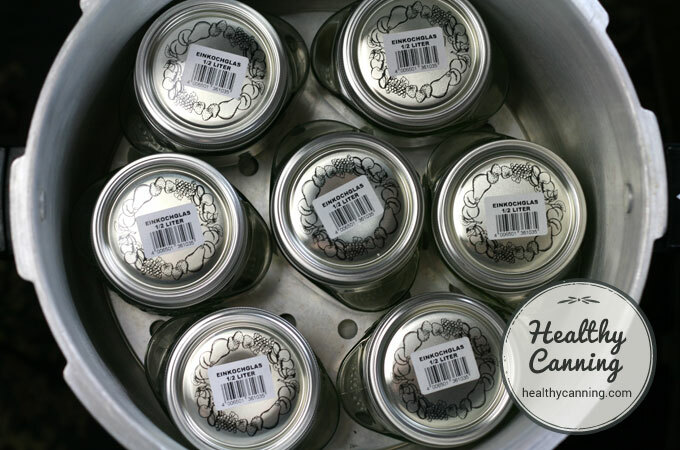 The bottoms of the jars are also sensibly engraved with the jar’s capacity in large, clear, easy-to-read lettering. It would be nice if Jarden took note of that for its Ball, Bernardin and Golden Harvest jars. Jarden lid with red ring on left; Leifheit lid with white ring on the right. 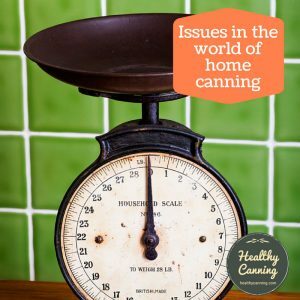 Should you use them for home pressure canning of low-acid foods? Each box of jars comes with a small recipe book. Do not, however, follow any of the recipes or the processing directions or tables provided in the Leifheit brochures. 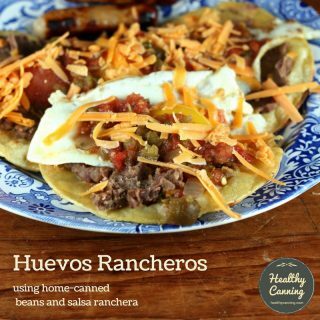 Their suggestions would all be deemed to be dangerous by the National Center for Home Food Preservation. 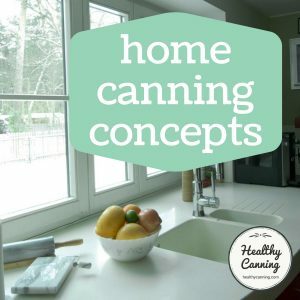 For instance, they endorse oven canning. 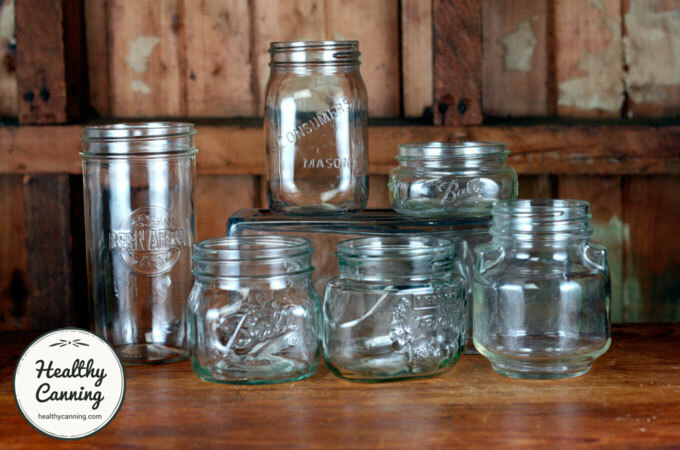 Some sources might suggest there would be the question of whether the shape is sufficiently different from that of North American mason jars so as to require completely separate heat penetration studies. 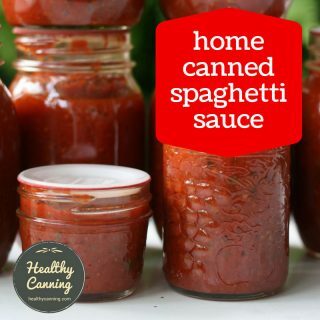 The shape and size of a jar does have an effect on the safety of the canning process, so it should not be assumed that our recommended processes can be used with jars other than the standard sizes and shapes of Mason-type jars manufactured for home canning. …. 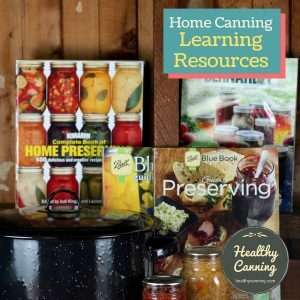 The suitability of jars… for our recommend process times will be limited by the size and shapes of jars, as well as heat tempering for canning.”  Andress, Elizabeth L. and Judy A. Harrison. So Easy to Preserve. University of Georgia Cooperative Extension. Bulletin 989. Sixth Edition. 2014. Page 24. The squatness of a Leifheit isn’t too much different from the Ball square jar (which Ball certifies for all types of canning), and it’s certainly no wider “squat-wise” than the standard Jarden pint jar is tall. 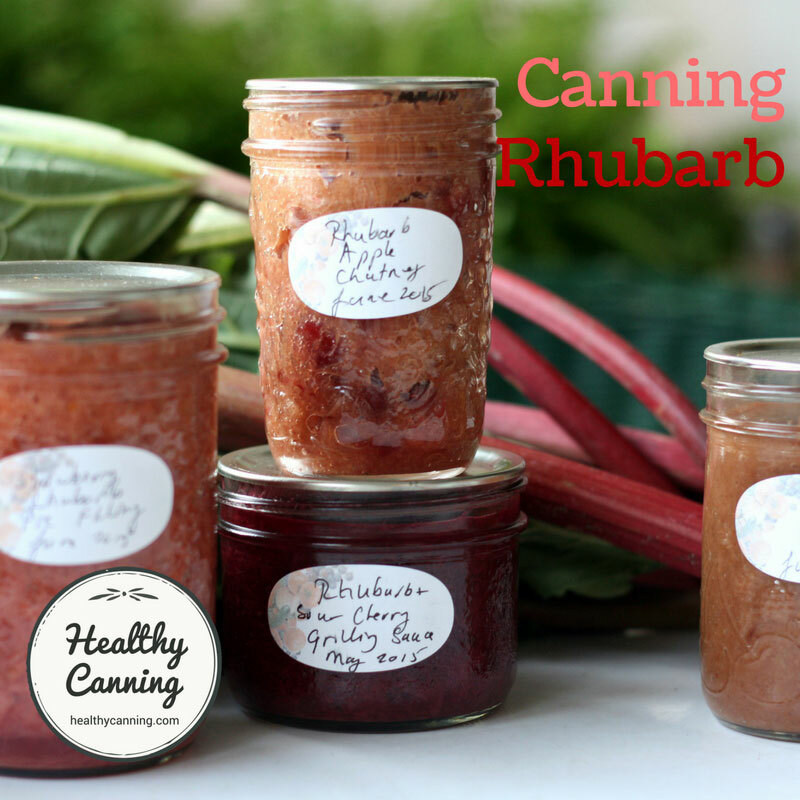 Leifheit and some other jar shapes in use now and in the recent past by canners. If one is going to question the shape of Leifheit jars, then it would be fair to wonder about other jar shapes people currently use or have used in the recent past. 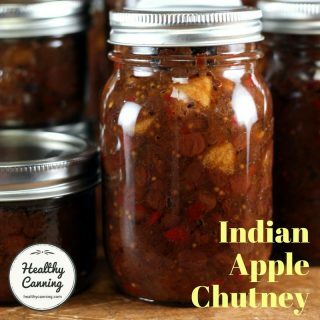 If shape is a concern, perhaps all these various jar shapes could be reserved for high-acid stuff only such as fruit and pickled items. Tattler re-usable wide mouth lids work on these Leifheit jars as well. 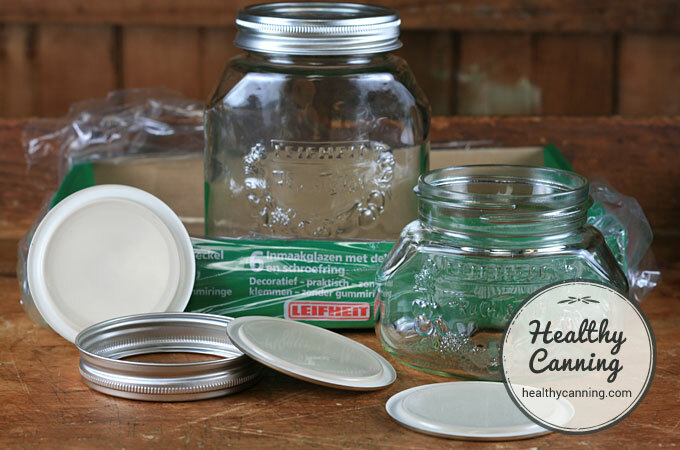 Tattler wide-mouth lids fit Leifheit jars perfectly. The Tattler wide-mouth lids look quite sleek on the Leifheit jars. 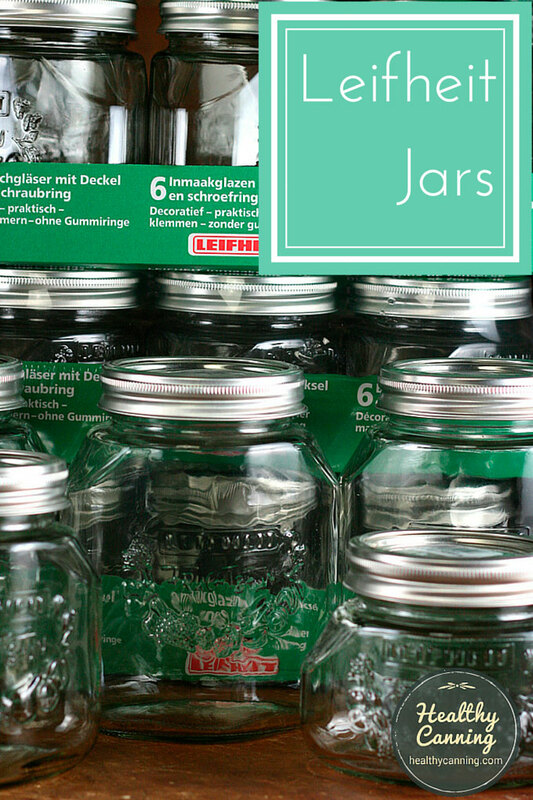 Jarden wide-mouth lids fit these Leifheit jars perfectly. We contacted our supplier and he told us that the inner lacquering is with BPA-NI-lacquers, but it is safe and under the allowed limits. The usage of this lacquers complies with the EU-regulations. During extracting-researches at this lacquers there was no free BPA detected, i.e. 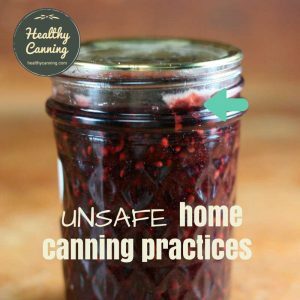 the concentration is under the detection limit.”  Anna-Christina Wahl, Leifheit customer service to healthycanning.com. 1 Apr 2015. Correspondence on file. 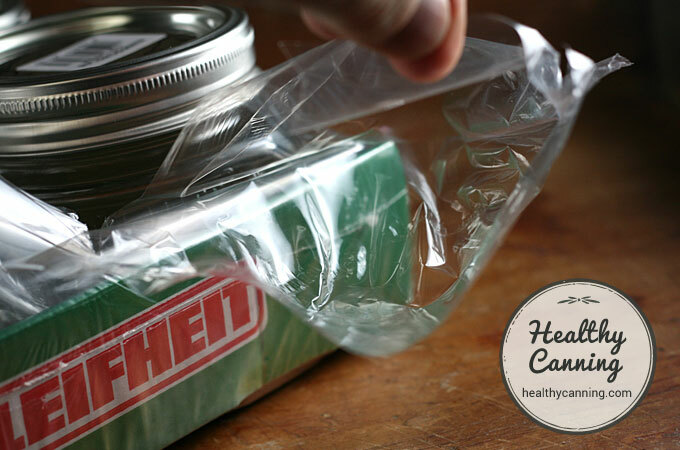 But as you have seen already, you don’t need to use Leifheit lids: you can use Jarden or Tattler lids with them. 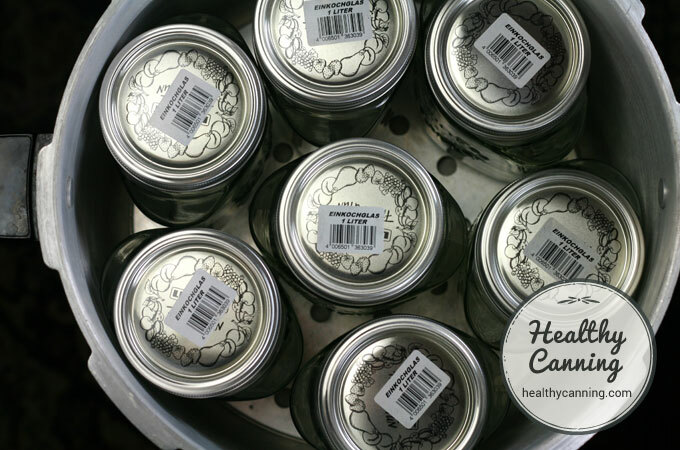 The jars are secured in the box by a doubled-layer of tough plastic that has some air between the layers. 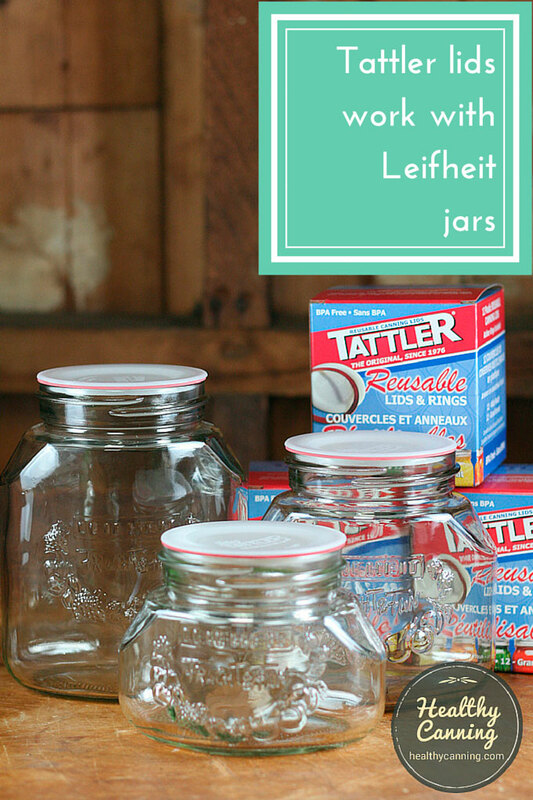 Leifheit jars are not cheap, even in Germany, but they are beautiful, and are so sturdy that they should last for several generations of use. The 1 litre size is 4 cup. 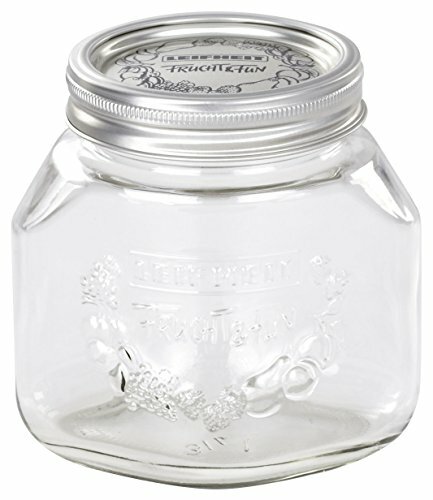 If you are in Europe, these Leifheit jars owing to their Mason-jar style lids could be a safer choice to investigate for a preserving jar than bail-type clamp lids. 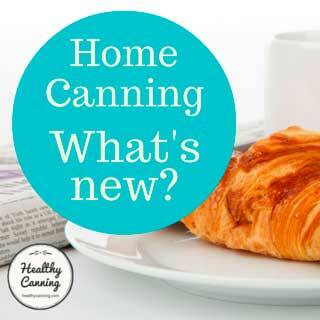 It’s nice that they are certified material-wise for pressure canning as well. 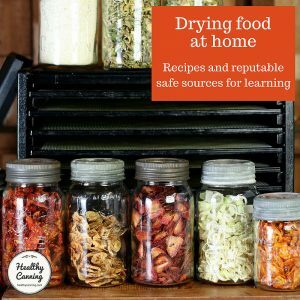 Here are some links if you want to research these Leifheit jars on Amazon. 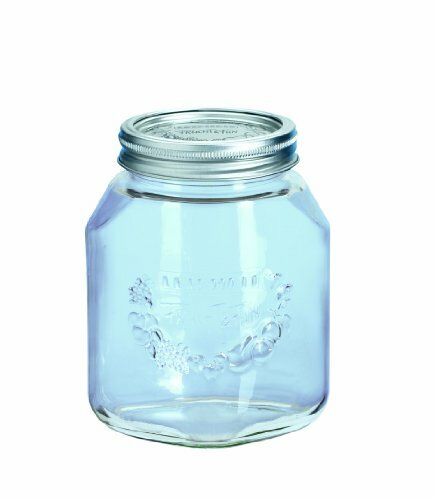 Note 1: Someone at some point took some stock photos that came out funky and made the jars and even their lids look blue; they are not, they are clear glass as you saw above. 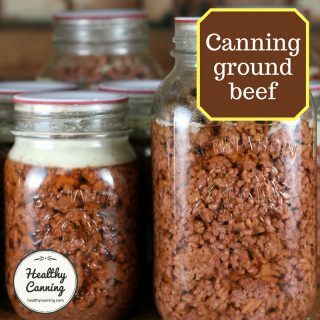 Note 2: There’s also a 1/4 litre / 1 cup size but as that doesn’t take a standard Mason lid, we haven’t covered it here for the purposes of safe home canning. Note 3: There are no processing times, usually, set for 3/4 litre (1 1/2 pint / 3 cup) jars. 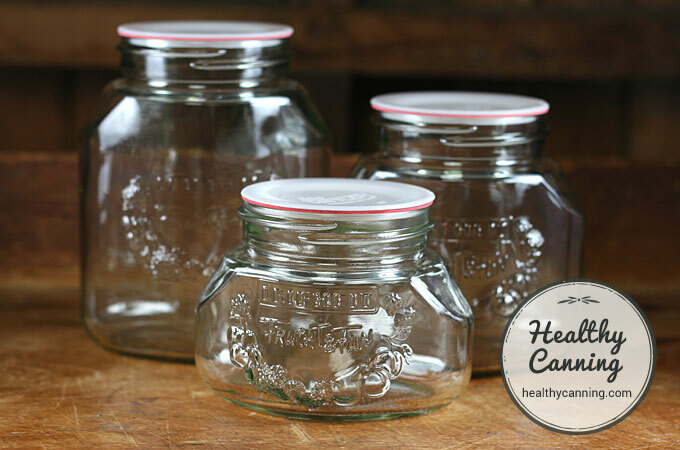 For processing times, they need to be treated as though they were 1 litre / 1 US quart jars. If a recipe doesn’t allow 1 litre / 1 US quart jars, then you can’t use the 3/4 litre jars for it. 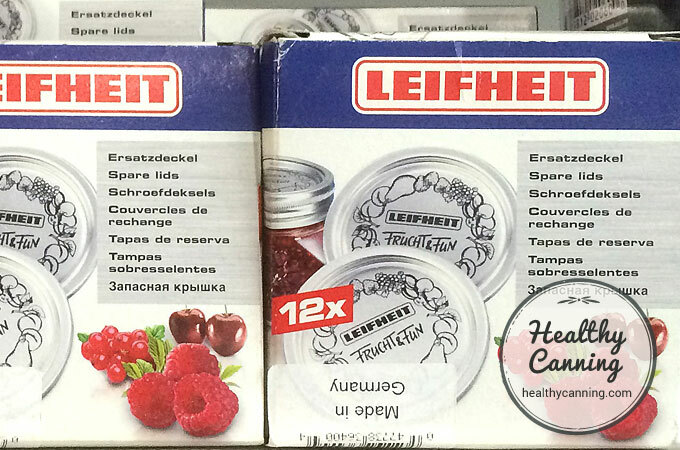 Leifheit is an American-owned Germany company. Leifheit was founded in Nassau, Germany in 1959 by the husband and wife team of Ingeborg and Günter Leifheit (Günter born 1920; died 2009.) The original name of the company was Günter Leifheit KG. Their first product was carpet sweepers. The company now makes many domestic appliances, particularly those related to cleaning, laundry care, kitchen and well-being. Consumers might also know them under the Dr. Oetker name, for which they make the bakeware, and under the Soehnle name for kitchen scales. In 1972, ownership of the company was acquired by the American ITT corporation. 4. 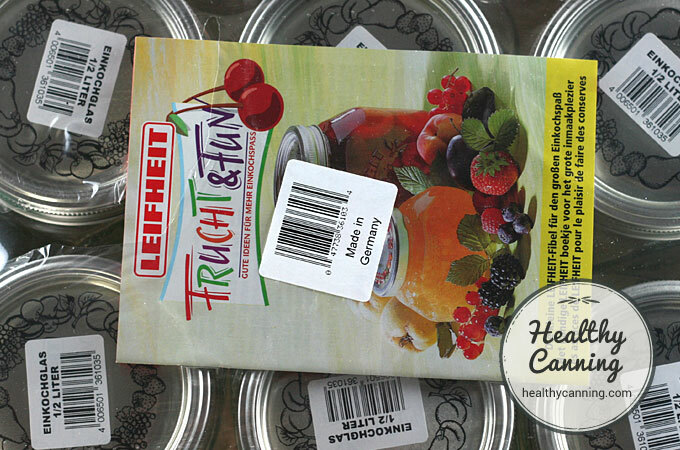 ↑ Anna-Christina Wahl, Leifheit customer service to healthycanning.com. 1 Apr 2015. Correspondence on file. 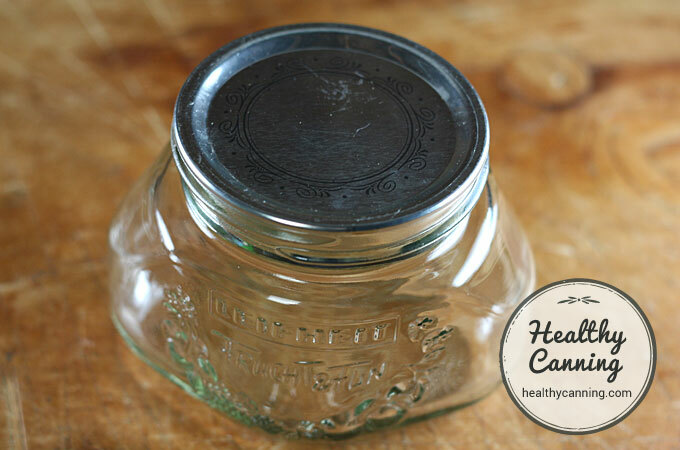 Are Leifheit Preserving Glass Jar suitable for making Kefir? 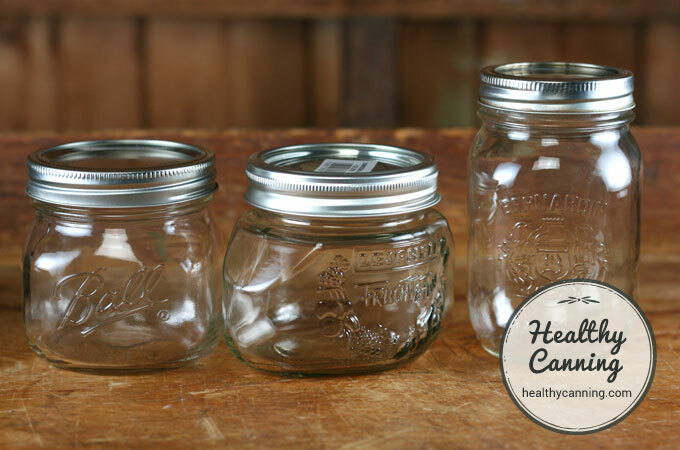 Mason jars are suitable for making Kefir in, and Leifheit jars are essentially Mason jars by another name, fully tempered glass. Thanks for the info Randal. 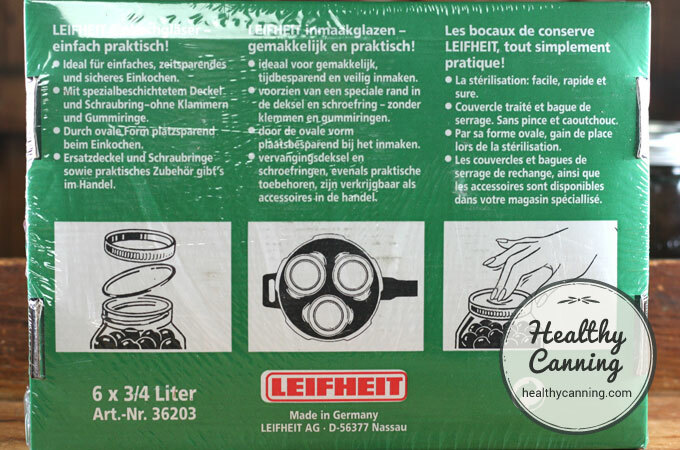 Do the Leifheit lids function the same as Ball/Kerr lids? They don’t appear to have a ‘button’ like the North American beans do. I processed three jars of pickled beets today, two Liefheit lids and one Ball, and neither of the Leifheit sealed, while the Ball did. I wonder if I need to do something different with them? How odd, and annoying! Yes, Leifheit’s two piece lids do function the same.